Nodal precession is the precession of the orbital plane of a satellite around the rotational axis of an astronomical body such as Earth. This precession is due to the non-spherical nature of a rotating body, which creates a non-uniform gravitational field. The following discussion relates to low Earth orbit of artificial satellites, which have no measurable effect on the motion of Earth. The nodal precession of more massive, natural satellites like the Moon is more complex. Around a spherical body, an orbital plane would remain fixed in space around the gravitational primary body. However, most bodies rotate, which causes an equatorial bulge. This bulge creates a gravitational effect that causes orbits to precess around the rotational axis of the primary body. The direction of precession is opposite the direction of revolution. For a typical prograde orbit around Earth (that is, in the direction of primary body's rotation), the longitude of the ascending node decreases, that is the node precesses westward. If the orbit is retrograde, this increases the longitude of the ascending node, that is the node precesses eastward. This nodal progression enables heliosynchronous orbits to maintain a nearly constant angle relative to the Sun. A non-rotating body of planetary scale or larger would be pulled by gravity into a sphere. Virtually all bodies rotate, however. The centrifugal force deforms the body so that it has an equatorial bulge. 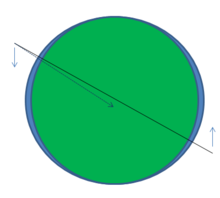 Because of the bulge the gravitational force on the satellite is not directly toward the center of the central body, but is offset toward the equator. Whichever hemisphere the satellite is in it is preferentially pulled slightly toward the equator. This creates a torque on the orbit. This torque does not reduce the inclination; rather, it causes a torque-induced gyroscopic precession, which causes the orbital nodes to drift with time. The rate of precession depends on the inclination of the orbital plane to the equatorial plane, as well as the orbital eccentricity. J2 is the body's second dynamic form factor (−√5C20 = 6997108262668000000♠1.08262668×10−3 for Earth). GME is the product of the universal constant of gravitation and the central body's mass (7014398600441800000♠3.986004418×1014 m3/s2 for Earth). This is equivalent to −3.683° per day, so the orbit plane will make one complete turn (in inertial space) in 98 days. The apparent motion of the sun is approximately +1° per day (360° per year / 365.2422 days per tropical year ≈ 0.9856473° per day), so apparent motion of the sun relative to the orbit plane is about 2.8° per day, resulting in a complete cycle in about 127 days. For retrograde orbits ω is negative, so the precession becomes positive. (Alternatively, ω can be thought of as positive but the inclination is greater than 90°, so the cosine of the inclination is negative.) In this case it is possible to make the precession approximately match the apparent motion of the sun, resulting in a heliosynchronous orbit. ^ Brown, Charles. Elements of spacecraft design. p. 106.